NYC protesters rally against U.S.-led wars, imperialism | Fight Back! 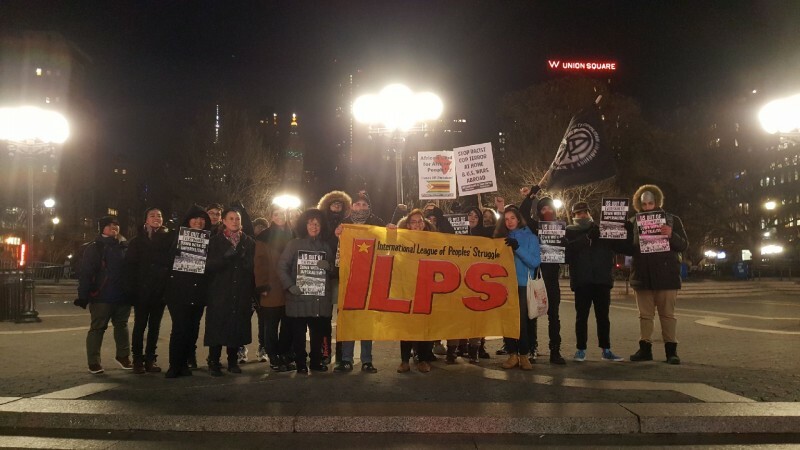 New York, NY—On Jan. 18, several dozen organizers gathered in the below-freezing evening to demand an end to all U.S.-led wars and imperialism. The event was organized by the different groups in the International League of Peoples’ Struggles as part of the #DaysOfRage. This whole week was marked by different actions by different New York groups as a way a build up to J20, which is this Saturday. This Saturday marks the one-year anniversary of the Trump administration taking office. In this one year, we’ve seen a rise of protests against Trump’s policies of racism, islamophobia, queerphobia, sexism and bigotry. #DaysOfRage is a protest that denounces the Trump administration and capitalism. The protesters gathered in Union Square handed out flyers listing out events and facts that occurred during the Trump era – such as deploying the Mother of All Bombs in Afghanistan and the approved $700 billion defense budget. There were speakers from several different groups from the ILPS that related war and imperialism back to the struggles they represented. Mainly, organizers were pushing those passing by to attend the rally this coming Saturday. The J20 rally is going to be this Saturday, Jan. 20 at 4 p.m. in Grand Central Station.